AAV-6 CMV Expression System | Cell Biolabs, Inc. The AAV Helper Free System produces recombinant AAV containing your gene of interest without the need to use a helper adenovirus. 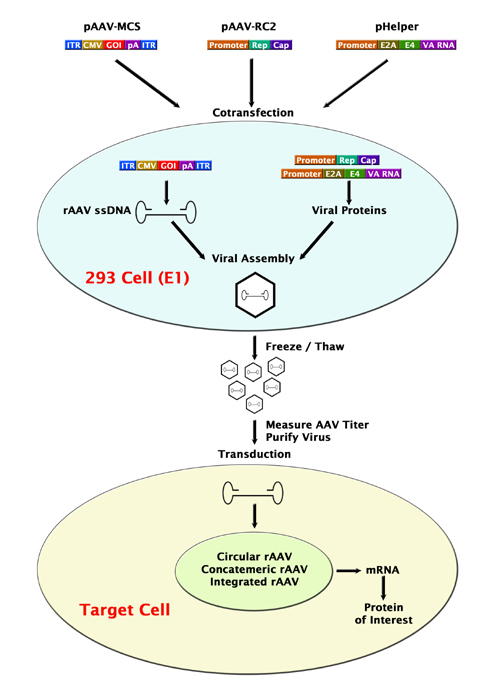 The adenoviral genes required for proper AAV packaging are provided in the pHelper plasmid (E2A, E4 and VA RNA) or in the 293 packaging cells (E1). Figure 1: Production and Transduction of Recombinant AAV. AAV2-GFP was produced by cotransfection of 293AAV cells (Catalog #AAV-100) with pAAV-GFP, pAAV-RC2, and pHelper plasmids. Upon harvesting viral supernatant, 293AD cells (Catalog #AD-100) were infected with AAV2-GFP for 48 hours.